Samuel Porter Jones was one of the country’s most prominent Evangelists from the late 1870s until his death in 1906—the Ryman Auditorium in Nashville, home of The Grand Ole Opry, was originally called The Union Gospel Tabernacle and was built for Jones’ ministry. Jones was not a baseball fan. 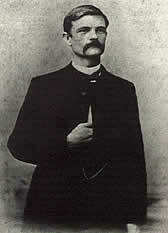 Speaking at a tent revival in his hometown of Cartersville, Georgia in 1885 Jones stirred up a crowd with his attack on the game. The evangelist, and others who railed against the game in the late 19th Century did little to curb the growing popularity of the game..
Jones is buried in Cartersville. 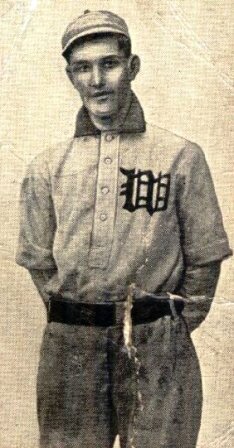 Cartersville’s other connection to baseball is seven time American League all-star Rudy York, who played for the Detroit Tigers, Boston Red Sox, Chicago White Sox and Philadelphia Athletics. 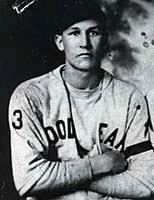 York’s family moved there in his teens, and he played ball on a company team at the local textile mill and for the Atlantic Transportation Company team in nearby Atco, Georgia, before being signed for the Tigers by scout Eddie Goostree in 1933. Rudy York, circa 1930, with local textile mill team. York died in 1970 and is buried four miles away from Jones in Cartersville.